This sweeping American epic reveals one of the greatest untold stories of the nineteenth century: the fierce rivalry between two great Cherokee chiefs that led to war, forced migration, and the devastation of a once-proud nation. 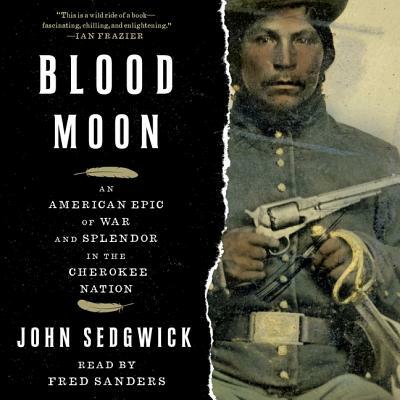 In this epic saga, John Sedgwick brings to life an untold chapter of American history through the relationship between one chief called The Ridge, a fearsome warrior who spoke no English but whose exploits on the battlefield were legendary, and John Ross, who was the Cherokees' primary chief for nearly forty years, yet displayed the Scottish side of his mixed-blood heritage and spoke not a word of Cherokee. To protect their sacred landholdings from American encroachment, these two men negotiated with almost every American president from George Washington through Abraham Lincoln. At first friends and allies, they broke on the subject of Removal, breeding an enmity that lead to a bloody civil war within Cherokee Nation that culminated in the two factions battling each other in the War Between the States. Dramatic, far-reaching, and unforgettable, Blood Moon paints a portrait of these two inspirational leaders who worked together to lift their people to the height of culture and learning as the most civilized tribe in the nation, and then drop them to the depths of ruin and despair as they turned against each other. Theirs is a story of land, pride, honor, and loss that forms much of the country's mythic past today.